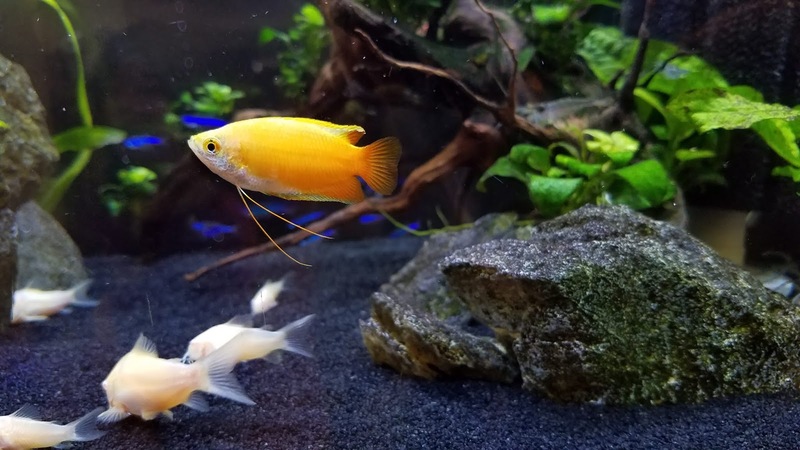 A GAMER'S WIFE: Honey Gourami Care Guide: Housing, Food, and Tank Mates! 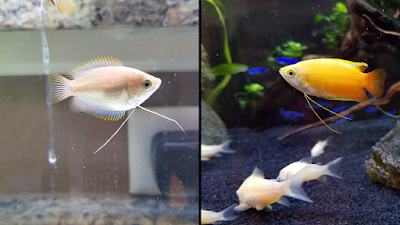 Honey Gourami Care Guide: Housing, Food, and Tank Mates! Are you looking for a colorful centerpiece fish for a small-or medium-sized community tank? The challenge is finding a bigger fish that won't eat or bully smaller, peaceful nano fish. Betta fish worked well for me in the past, but then I had bad luck with dwarf gouramis and apistogrammas. Surprisingly, the understated honey gourami ended up being the perfect choice for my 20-gallon aquarium! 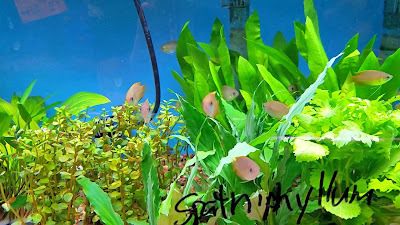 What is a Honey Gourami? Despite having similar common names, the honey gourami (Trichogaster chuna) is not the same thing as the dwarf gourami (Trichogaster lalius). 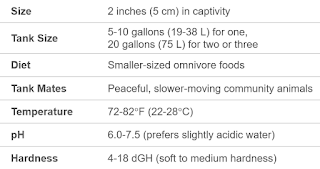 In general, honey gouramis are smaller and more peaceful than dwarf gouramis, only reaching about 2 inches (5 cm) in captivity. Also, because they’re different species, the honey gourami doesn’t appear to carry the dreaded dwarf gourami iridovirus. 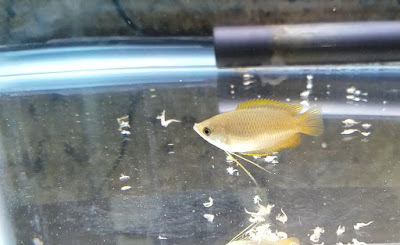 What Colors Do Honey Gouramis Come In? Females will tend to be paler in color than males, with a brown line extending all the way from the eye to the base of their tail, whereas males in breeding dress are very vibrantly colored and often have black markings on their throat and abdomen. Where Do Honey Gouramis Come From? They’re commonly found in northeastern India in low altitude, heavily vegetated, sluggish waters like ponds and ditches. The reason why they’re considered a very hardy beginner fish is because they regularly live through annual monsoon rains that will wreck havoc on their water temperature, parameters, clarity, etc. So that’s great news for novice fish keepers! What Kind of Tank Setup Is Recommended? Maybe 5-10 gallons for a single fish and 20 gallons for two to three fish. Like betta fish, gouramis are labyrinth fishes that can breathe from the surface, so they like to swim in the mid- to top levels of the aquarium, but I also find them at the bottom looking for food or just chilling. You’ll want slower water current, a lid to keep the surface air nice and humid, and because they can be a little timid, lots of plants and décor to make them more comfortable. What Should You Feed Them? Nothing to worry about there! 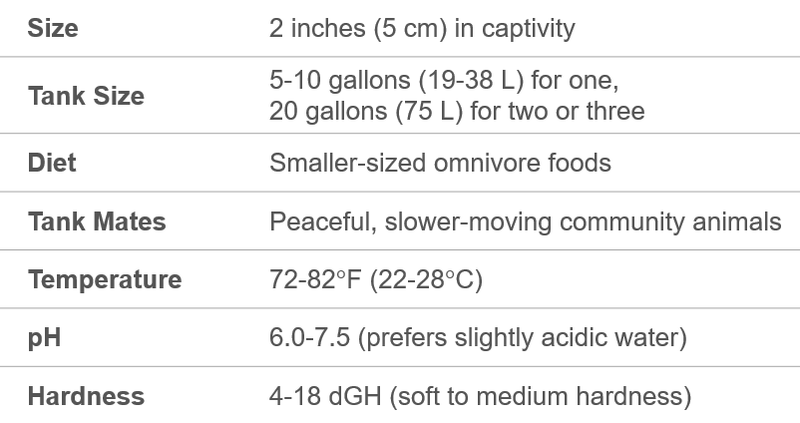 Honey gouramis have great appetites and aren’t very picky, so just give them a wide variety of any small-sized foods meant for omnivores – dried, frozen, live, or whatever. I personally feed mine Repashy Community Plus gel food, New Life Spectrum Small Fish Formula, Fluval Bug Bites, freeze-dried bloodworms, and various frozen foods. What About Tank Mates for Honey Gouramis? They definitely live up to their reputation as a peaceful, slow-moving community fish, so keep them with other calm fish like small tetras and corydoras. Don’t choose tank mates that are super active, will pick on them, or will outcompete them for food – like tiger barbs or my bully of a German blue ram. My honey gourami stayed hidden the whole time till that blue ram died, and even then, the poor thing had PTSD and would never come out. Honey gouramis are not a schooling fish per se, but if you keep multiples, they will form a hierarchy of sorts where the dominant ones chase the others away during from food or their favorite spots. When I had two females in quarantine, I noticed that even if I spread out the food, the dominant female would leave her pile of food to swim all the way across the tank and chase the other female away from her pile of food. So they’re not entirely as peaceful as, like, corydoras or something. How Do You Breed Honey Gouramis? It's pretty easy and I plan to write a second article all about it. Like bettas, the male makes a bubble nest, courts the female, and then scoops up the fertilized eggs into the nest, guarding them until they hatch in 24-36 hours. Unfortunately, the fry are extremely tiny, so you'll have to work a little harder to feed them in the beginning. 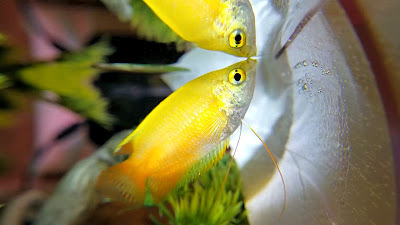 So Is the Honey Gourami Worth It? Heck yeah, two thumbs up for an amazingly peaceful and resilient centerpiece fish. Don’t let those pale colors at the pet store fool you. Take that little underdog home, get him well-fed and happy, and you won’t be sorry for giving him a chance! What's your favorite centerpiece fish for a nano tank? Comment below to share your ideas. Don’t forget to take time to enjoy your aquariums and I’ll see you next time!